Up until very recently, Samsung has been relatively quiet about an official KitKat update for its flagship Galaxy S 4. Despite this, a leaked memo pointed towards a possible January release for the S4 and the Note 3. 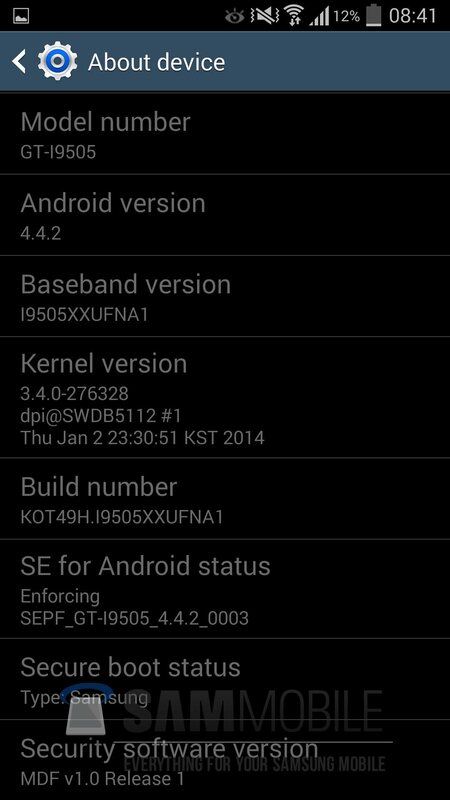 Now, it looks like Samsung is actively preparing for release, as a leaked 4.4.2-based firmware has appeared for the S4. A few days ago, we shared leaked screenshots that seemed to indicate that Samsung was working on a dramatic artistic redesign for their trademark TouchWiz UI. Unfortunately, this leaked build does not incorporate these graphical tweaks. However, progress is being made in the UI front, as the device now features a translucent notification bar with white icons. There are a few other changes such as a revised lock screen, tweaked keyboard, and performance improvements. For those looking to give the firmware a try, XDA Recognized Developer Faryaab has posted the leak to the forums. To give it a try, download the firmware over in the original thread. From there, you will need Odin to flash the ROM. And if you want root access, be sure to download the latest version of SuperSu or CF-Auto-Root, which have been updated to work with the leaked 4.4.2 firmware.